Used Stickley, Used Henkel-Harris, Used Restoration Hardware! 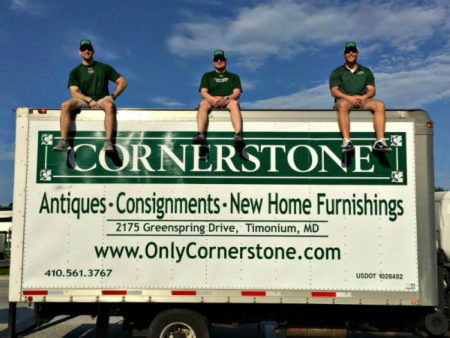 When Baltimore and Washington DC consumers want to find high quality furniture at just a fraction of the original cost, they Turn To Cornerstone! That’s because Cornerstone has been helping people furnish their homes with high quality, name-brand furniture for over 32 years. Pictured here is some Dining Furniture in both Classic and Casual styles currently on our sales floor and Ready to be Delivered Today! So, whether you prefer the word “pre-owned”, “used”, “vintage”, or “consignment”- just remember “Cornerstone”! That’s where you’ll find an Ever-Changing Inventory of America’s Finest Furniture at incredible prices. For Even More Savings– follow us on Facebook and join our Email Club to receive notices about special events and sales planned just for you! Wonderful Selection of Bookcases in Timonium, MD Furniture Store! 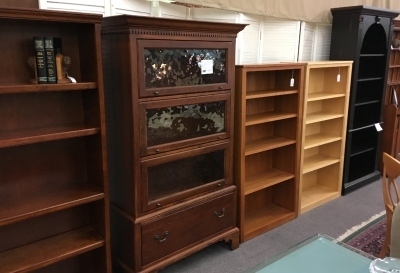 Pictured here are some of the many bookcases available for sale at Baltimore’s Favorite Furniture Consignment Store! So,if your home office is in need of a major reorganizing before welcoming Holiday Guests, Wait No More! Shop now while the selection is great and you can Have it Home Today! Cornerstone also has a Fabulous Selection of Tables, Breakfronts, Chairs, Sideboards and Corner Cabinets. Whether you like Rustic, Formal, Casual or Contemporary, we’ve got Furniture that’s sure to make Entertaining a Joy! Visit us today. We’re just North of the Baltimore Beltway in Timonium, MD! Let Us Do the Heavy Lifting! September 27th, 28th and 29th, 2018! If you’ve been putting off buying that new dining room table because you don’t want to borrow the neighbor’s truck, Wait No More! Cornerstone is offering Free Local Delivery on all furniture purchases made this Thursday, Friday and Saturday. If you’re beyond our “local” area, you can Still Save Money! We’ll take $100 off the delivery fee for customers outside of the local area. Join Our Email Club to Receive Special Offers / Discounts! Cornerstone’s Email Club Members Get Special Perks! If you love furniture as much as we do and Love Saving Money, our Email Club is something you’ll want to know about. Whether it’s a Free Delivery Day, Exciting Store News, or Exclusive Discounts, Cornerstone’s Email Club will keep you informed without clogging your inbox! That’s because our news and offers are the Real Thing! That means you’ll only hear from us one or two times per month. And unlike other companies, you’ll be thrilled to open these emails because they’ve got Information and Special Offers that you’re truly interested in hearing about! Here’s a list of items that we just sent to our members. Each item was Greatly Discounted and was only for our Email Club Members to Enjoy! So don’t delay. Join today by clicking under our “Buying” tab on our website at the top of each page! 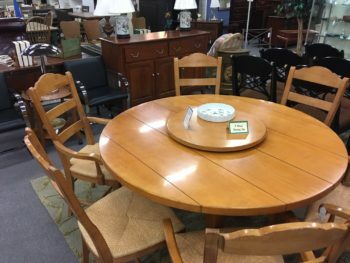 August 2, 2018- Selling High Quality Close-Out Furniture While Supplies Last! 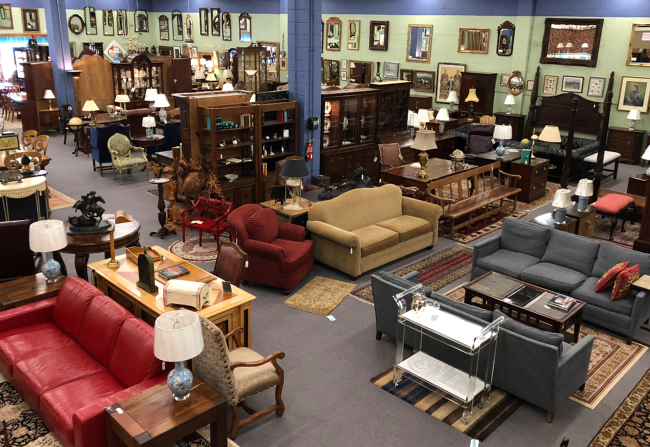 Another busy day at Baltimore’s Favorite Furniture Consignment Store as we sort through Two Truckloads of Brand New Furniture Close-outs! 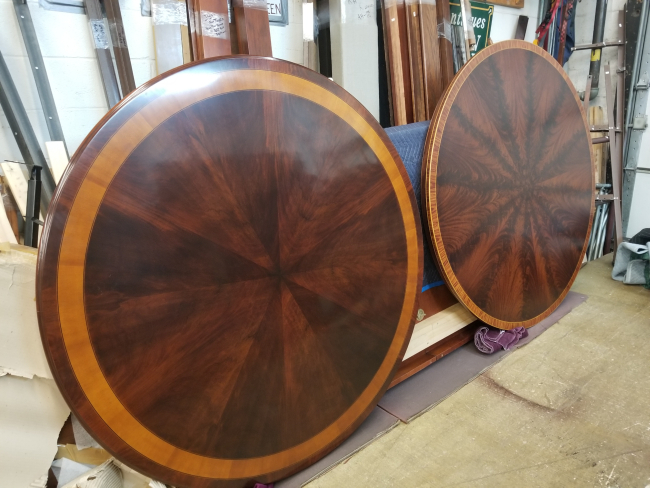 We’ve got Round Mahogany Inlaid Tables, Sideboards, Chairs, Secretary Desks, Demilune Tables and More! Super nice furniture that is sure to please. We’re helping a local business liquidate after furnishing High End Niche Hotel Properties on the East Coast. All of these Finely-Made Pieces are Brand New and just Out of the Box. No damaged or problems here. Please don’t delay. Although we have two truckloads to sell, the Quality, Style and Price of these pieces make a Value that assures quick sales! Who gives you the opportunity to buy Brand New Furniture at a Fraction of the Original Cost?…..Only Cornerstone! Netflix “House of Cards” Props / Set Pieces for Sale! 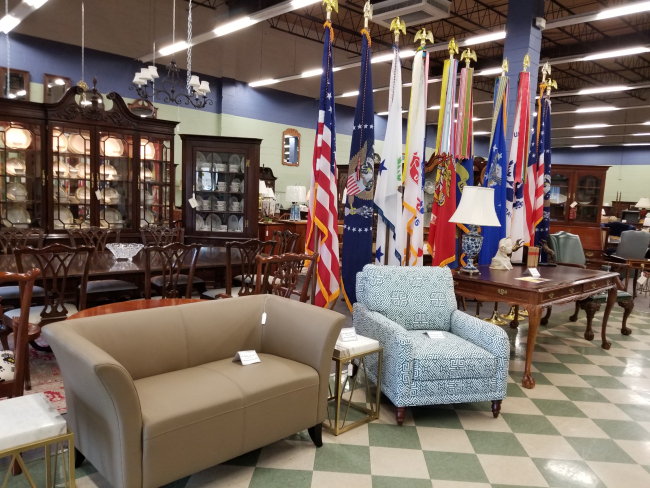 After years of helping fill the sets of the Baltimore made “House of Cards” Netflix series, Cornerstone is now helping the production company “Clear House” by Selling Furniture and Accessories from the Iconic Sets! We’re still unpacking and placing the many pieces we have to sell. But, as you can see from this picture taken yesterday, the front row of our store is filled with pieces from the show. 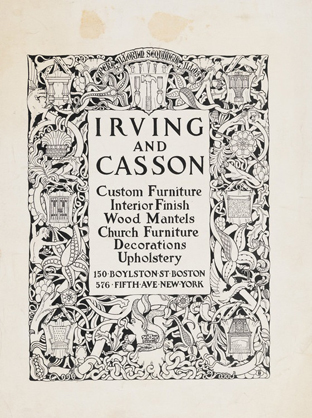 Many of the items include a photo with the piece so that the new owner will have a provenance to go along with it. Like most things at Baltimore’s Favorite Consignment Store, these House of Cards Treasures are sure to sell quickly. So, don’t delay, come in today for the best selection! 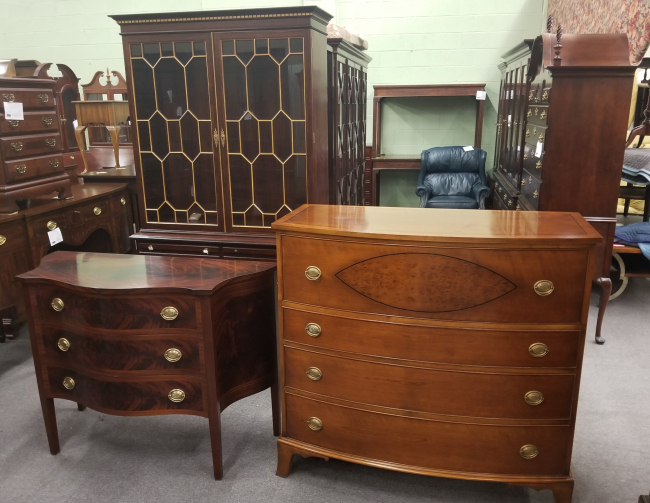 Beautiful Bedroom Furniture on Consignment Now! 1. Pick your bed size. We’ve got a great selection of King, Queen and Full Beds! 2. Pick your pieces. 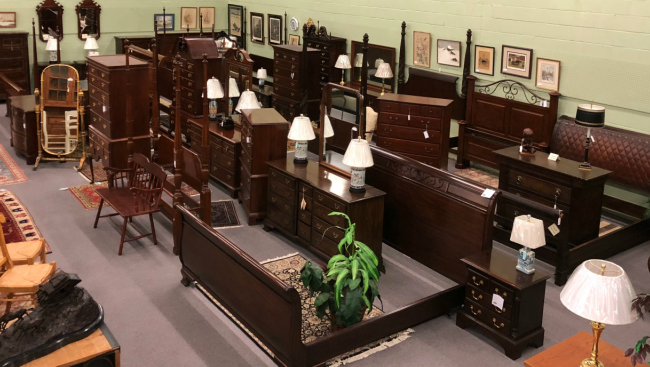 Choose from Dressers, Tall Chests, Highboys, Nightstands, Bedside Chests and More! 3. Set up delivery. Our trained delivery staff will assure that your new pieces arrive safely and are placed just where you want them! Pictured here are just some of the many bedroom pieces available today. We also have bedroom furniture in our Preview Room and Dock area, with more arriving daily! Henkel Harris- Used, Henkel Harris- Preowned, Henkel Harris- Bargains! 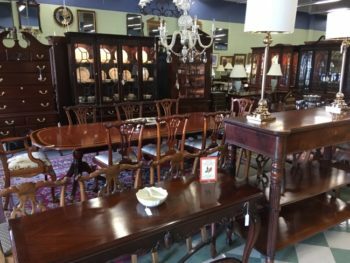 There’s a lot of ways to describe Henkel Harris Furniture on Consignment. We think you’ll describe this Dining Room Furniture purchased in 2012 as “Like New”! Not only does this set still look like the day it arrived at the original owner’s home, it also includes some very unique pieces as well. The Sideboard Credenza, model number 2369, is one we’ve never had on consignment until now. 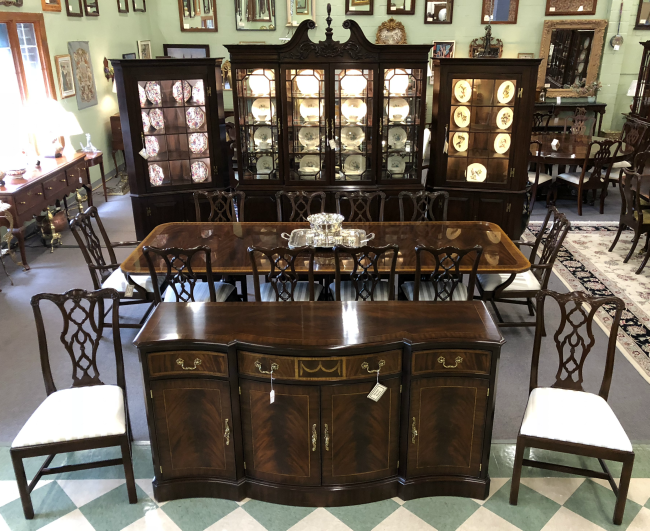 With an MSRP of $17,210, not a lot of these fine buffets were made! The Breakfront, model number 2382CL, is also a rare piece from this wonderful manufacturer. It has an MSRP of $36,395! Of course, Cornerstone’s Prices will Save You Thousands of Dollars! Just another example of why we’re Baltimore’s Biggest and Best Furniture Consignment Store!